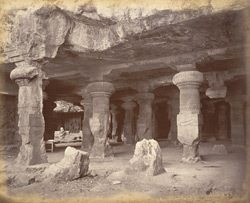 Photograph of the guardian figures in the cave temple at Elephanta, part of the Earl of Jersey Collection: 'India. Bombay to Madras', taken by an unknown photographer in the 1880s. The small island of Elephanta, off the coast of Bombay, is celebrated as the complexity of the plan makes it one of the greatest achievements in rock-cut architecture in India. The temple is dedicated to Shiva, dates to the 6th Century and consists of a series of chambers cut from the rock. There are five caves in total, but only the Great Cave can still be visited. The temple stands at 250 feet above sea level and measures 130 feet square, 17 feet high. At the centre of the cave is a hypostyle hall of 20 pillars in which stands the linga shrine, flanked by two excavated courts to the east and west of the shrine. The east entrance leads towards the sanctuary and the north entrance towards the great Trimurti, the triple-headed bust of Shiva. Large relief sculptures of the god Shiva decorate the interior of the cave. The columns of the hall, seen in this photograph, have squat tapering shafts and cushion-like capitals.